Premium quality 150Amp air-cooled WP-17 TIG complete torch package for Miller TIG welders with 25-foot rubber power cable. 1-Piece style: power/gas through one cable. With free gift (welding gloves or welding goggle or welding glasses). Free gift may vary upon availability. 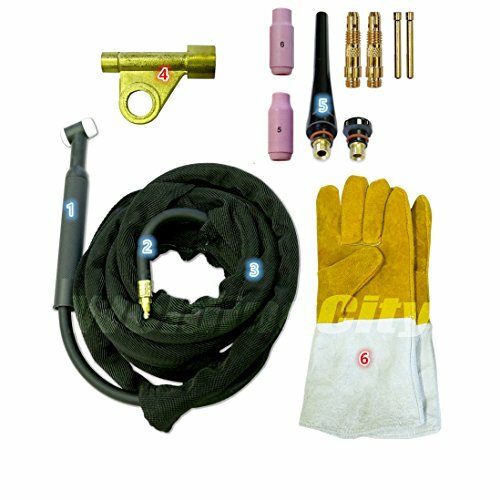 Premium quality 150Amp air-cooled WP-17 complete TIG welding torch package for all mainstream TIG welders with 25-foot rubber power cable. Package includes: WP-17 head body with handle; rubber power cable hose 57Y03R 25-foot; Nylon cable cover with zipper 24-foot; power cable adapter 105Z57; accessory kit and free gift.